New: Will President Trump help get the Syria and Iraq Genocide Relief bill passed? Update: 160,000 diapers purchased for distribution in Iraq – adult diapers still needed! HR-390 problem taken to Special Assistant to President Trump: By the first week of September I had tried just about everything to move Senator Bob Corker (R-TN) to release the Syria and Iraq Genocide Relief and Accountability Act (HR-390) from the Senate Foreign Relations Committee he chairs. Senator Corker has NOT been holding the bill because of any substantive issue. There is no one in the Senate — not a Republican nor a Democrat — who would dare vote against a bill to help the victims of genocide. HR-390 passed out of the House committee unanimously, and then on the floor was passed by an unprecedented voice vote in which there were no “nays” heard. Sadly, Senator Corker has held up this bill over a personal grudge against the author, Congressman Chris Smith. Apparently, the Senator believes that Congressman Smith “stole” the recognition and publicity from a bill they worked on jointly years ago. Yes … it is stupid and childish, particularly when realizing that both men are dedicated Christians and widely viewed as gentlemen. The article was delivered to Corker’s office — and still be did not budge. On September 13th, I tracked down a “Special Assistant” to President Trump, a man I have known for many years, and spoke with him very candidly about the problem with Senator Corker. He took lots of notes and promised me that he would see if the White House would take action. At that point, I was so fed up with the situation in the Senate that I thought about praying for a Tweet from President Trump asking Senator Corker to move the bill out of committee. After the meeting with the Special Assistant to the President, I gathered together all the information on the background of HR-390, as well as the many articles in various publications supporting the bill and sent them to him. I continue to pray that before you receive this newsletter some action has been taken by the White House, and the pressure we have applied to Senate Leader McConnell will have finally convinced Senator Corker to release HR-390. Religious Freedom Coalition furnishing water until December: The Christmas for Refugees and Diapers for Refugees programs are the biggest projects the Religious Freedom Coalition has in Lebanon, Jordan and Iraq — but we support many other smaller programs. 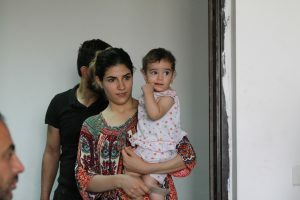 A lot of what the Religious Freedom Coalition does to assist displaced Christians in the Middle East is not very dramatic and photos really don’t tell the story. I rarely write to you about a lot of our smaller projects, because there is just not enough room in the newsletter. Some needs become so urgent I have to use existing funds and don’t have time to raise money. There are large aid organizations that send food to the refugees, and some send used clothing in huge lots. Because we are a smaller organization, I look for overlooked areas and projects that are ignored by the major agencies. For example, we supplied kerosene heaters and fuel for Christians in Jordan during the winter. Another example would be the women’s sanitary pads. And on one occasion we paid to clear through customs and transport containers of material that other ministries had shipped without realizing the cost to the ministry they were sending to. A picture of a water tower is not very dramatic. But it is tragic when empty. Up to seven family members live in each unit. There is one living/sleeping area plus a tiny bathroom and kitchen. Each month the Religious Freedom Coalition orders and has delivered 18,000 liters of water or 4,755 U.S. gallons. The camp requires 480,000 liters of water per month — that is 126,802 gallons. It sounds like a lot, but that is for drinking, bathing and cooling. Families must carefully ration their water. The average American uses 80 gallons of water per day for drinking, eating, bathing and to flush the toilet, or about 2,400 gallons per month. These families use far less — and they must also use the water to “cool” their units. I really wanted to buy all the water for the year after I met with some of the families and saw how they are forced to live until they can move back and rebuild their homes, but we just do not have the budget for over $20,000 of water per month. I offered the $1,000 per month because I could break that much out, and because I also learned that the camp could afford no meat purchases for the rest of the year because of the cost of the water. By paying a portion of the water bill, funds could be held back by the camp director to buy more food as the weather becomes cooler and less water is used. 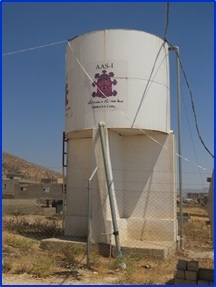 The Religious Freedom Coalition wires funds each month to the Assyrian Aid Society (AAS) which buys the water. Each month we are sent a receipt and photos of the water being delivered. The photos are not very dramatic. A large tanker truck pulls up to the camp and attaches a hose to the tank and pumps in the water. Water is delivered several times per month. In the end we just manage to do what God allows us to do to help Christian refugees. Purchase authorized — shipment expected: Every three months the Diapers for Refugees program orders 160,000 diapers for infants in Christian refugee centers in Iraq. Our goal for 2017 was 640,000 diapers. The infant diapers are manufactured in Turkey and of very high quality. We do not buy the cheapest diapers available, as they are not absorbent and children have developed rashes from them. Our goal is to help families avoid diaper rash that can become deadly in extreme cases. We buy our diapers from a wholesaler in Dohuk, Iraq which is closer to the Turkish border, and truck them to our warehouse in Erbil for distribution over three months. Iraq is not a third world nation. Up until the Second Gulf War the rate of college graduates was similar to the United States. So many schools have been destroyed since our invasion in 2003 that educational levels have dropped. Christians have been hit hard by the lack of schools as they have been forced from their homes. I visited Dohuk in June. It is a large modern city of about 300,000 that has escaped most of the ravages of war the last 13 years. It is also the location of Camp Odrana which we assist with water and which is managed by the Assyrian Aid Society. Diaper Campaign paid in full? : Early this year I pushed hard to fund the Diapers for Refugees program 100% by the end of summer to free up our fund-raising activities for the Christmas for Refugees program. The goal for infant diapers was $72,000 and in total we raised $75,095. I announced in the Chairman’s Report and on the Diapers for Refugees Internet site that our goal had been reached. I wish I had not done that. The cost of the diapers has not increased but there are some needs we were not aware of at first. The women we give the diapers to are young mothers much in need of feminine supplies such as sanitary pads. I managed to find enough funds for those mothers receiving the diapers in June. 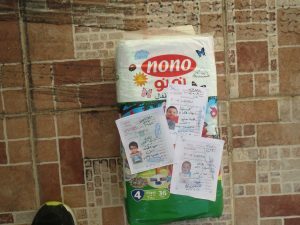 Then we learned that some of the very elderly were coming to our distributions begging for some of the larger diapers so they could try to use them for incontinence. Out of our general fund I paid for adult diapers for the relatives of those active in the diaper program. BOTTOM LINE: I need some funds to continue distributing the sanitary pads and adult diapers. The demand is not great enough to begin a major campaign, but I have added the need to the list of needs sent with every issue of the Chairman’s Report. After distribution of the September shipment is completed, there will be one more shipment of 160,000 diapers in December. The diaper distributions in December will begin at the same time as our Christmas program in Iraq. Distribution has become more difficult as some families attempt to move back to rebuild their destroyed homes. In June I was present when we distributed diapers in Qaraqosh, a town near Erbil which was completely overrun, looted and all but destroyed by ISIS. 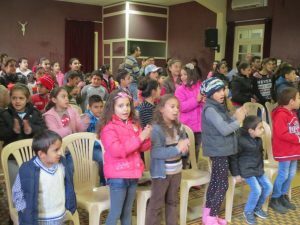 Christmas for Refugees program varies to meet local needs: The core of the Christmas for Refugees program is the same in Lebanon, Jordan and Iraq, but the local needs in each of those nations are different, as are the customs. 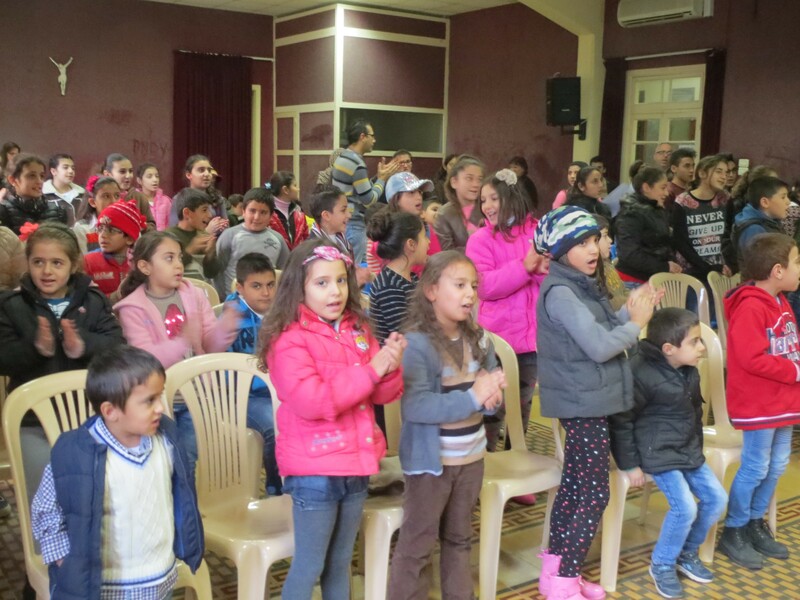 In Lebanon, the Christmas events for the children are held in locations all over the country, because the Christian families are scattered. Because Lebanon is 40% Christian, we are often able to use church buildings and have some church staff to help — although in some areas of high Muslim concentration we do have to use public centers. The events generally are for 100 to 150 children each. When we began the Christmas program in Jordan six years ago the main need was for food, and we had large packages of food for the children to take home to their families. In some locations in Lebanon, we gave the families vouchers to shop at Christian owned grocery stores. As the situation changed and more ministries brought in food, we filled the needs for hygiene materials (soaps, disinfectants, etc.) that others were not providing. There is still a great need for these hygiene kits in Jordan and Iraq, but not as much now in Lebanon. The need there now is blankets for the children. Most of the Christian refugees live in the mountain areas where it is very cold during the winter, not on the coast next to the warm Mediterranean Sea. The ministry overseeing our programs in Lebanon has requested that they be allowed to furnish two full size blankets for each child’s family, instead of the hygiene kits. Just after the request was made I learned of a Christian ministry that had set up a small blanket manufacturing plant to help refugees from Iraq and Syria make a living. They have been contacted and will sell us the blankets at wholesale. This is a double win for the Christian refugees. The children’s families get blankets for the winter — and other Christian refugees get some income from making the blankets! The Matching Challenge is coming: Generous supporters of the Religious Freedom Coalition are helping to set up a matching gift fund this year so that donations for the 2017 Christmas for Refugees program can be doubled, just as they were last year. As soon as the fund has been set up, I will let everyone know exactly how much is pledged and how they can help the Christmas for Refugees program so that their gift is doubled! In 2017 the Christmas program will grow — more Christian refugee children will have a warm place, with a good meal and a program of spiritual growth where Christ is the center. Our goal is to restore the hope many have lost, by telling them how Jesus can be with them forever! Get people to send cards, letters and e-mail to Senator Corker to release bill HR-390.